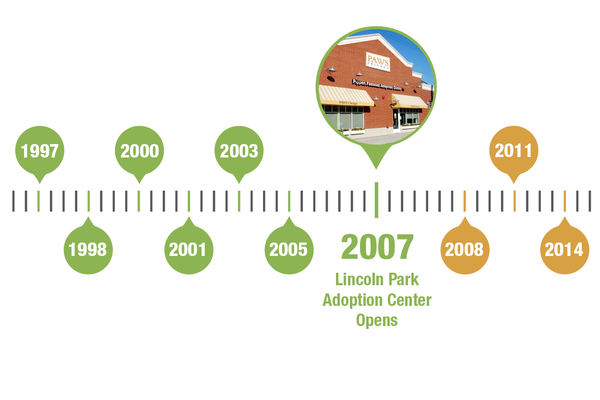 On September 7, 2007, PAWS Chicago opened the cageless, state-of-the-art Pippen Fasseas Adoption Center at 1997 N. Clybourn. Four years of planning and construction led to Opening Night, when homeless cats and dogs first entered their suites. The new Adoption Center was designed to be bright and welcoming for both people and pets, encouraging adopters to come to the shelter, rather than buy pets from pet stores or breeders. The design would also help attract a volunteer workforce to help care for homeless pets and work with prospective adopters to match them with the right pet. PAWS Chicago has received Charity Navigator’s top, four-star rating every year. 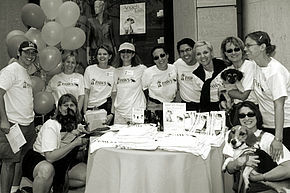 But in 2007, PAWS Chicago received an even higher honor. Charity Navigator placed PAWS Chicago as #4 on its Charity Hall of Fame list, featuring the top 10 charities in the nation. Charity Navigator evaluates the transparency and financial efficiency of not-for-profit organizations to help inform donors.